Bossier is home to a growing population of 20- and 30-somethings that will help shape the future. Teachers in Bossier especially play an important role by educating our future leaders. Our Millennial Pro this month is teacher Libbi Lange. The 23-year-old Haughton native is a graduate of Louisiana Tech and Kappa Delta Sorority member. 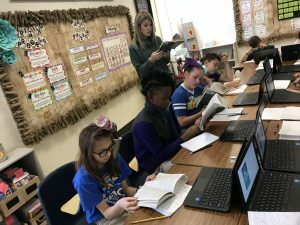 Upon returning to Bossier, she fulfilled her dream of becoming a fourth grade teacher at Legacy Elementary. She says working for Bossier Schools has been a dream come true. During her senior year at Louisiana Tech, Libbi was a Clinical Resident, a year-long student teaching program, at Sallie Humble Elementary School in Monroe. 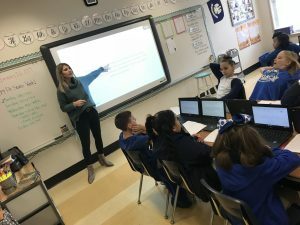 She taught third grade math, this along with working with her mentor, helped her grow into an effective teacher by getting her year of ‘firsts’ out of the way. She originally wanted to be a journalist for ESPN, but knew in her heart that service was the most important thing to her, next to education. Libbi says her sorority pushed her out of her shell and allowed her to take advantage of numerous opportunities on campus such as being a student recruiter, Orientation Student Leader, a member of A+Pel — a professional education community — a member of the 2017 Homecoming court, and a 2018 Who’s Who recipient. Some of her hobbies include: serving as the Communications Chair for The Shreveport-Bossier Kappa Delta Alumnae Chapter, running, reading and going to the lake with her family. Libbi says the support as a teacher is overwhelming and while prepping her classroom, she had a shortage of books and came home to boxes of books on her doorstep with kind notes of encouragement. 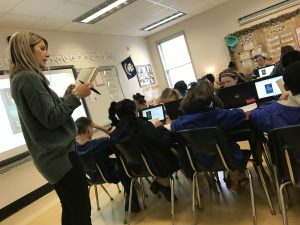 After she sent her resume to Legacy Elementary, the emphasis on technology there — such as students in grades 3-5 having 1:1 technology — showed Libbi that Legacy knew how to make sure every student was going to have what they needed to be successful, especially in a world ruled by tech. Libbi believes that education is the door for opportunity. She says school teaches students how to work with others, the correct manners for public settings, and skills that will help them become good people. She says degree, whether it is continuing education or a technical degree, shows more than a person’s knowledge of content, it shows that someone knows how to set a goal, work for it and complete it. Her future aspirations are to obtain a Master’s degree in educational leadership and then one day move into an administrative position. She also hopes to move up further in the system to one day being on the parish school board, the State Board, or even the National Board of Education. Libbi’s favorite parts about teaching are the “light-bulb” moments when a student understands something clearly or finally masters a concept, hugs in the morning, and the personal conversations about a student’s puppy, big sister, or sporting event. But the most important thing about teaching is being a constant and positive influence in her students’ lives. “They know that when they come to school they are expected to be kind to each other, are safe, and are loved,” she said. Her favorite thing about Bossier is the way the community rallies together to support each other. Chimi-V’s and Nicky’s, and catching local bands at The Stage. One thing she would like to see Bossier have in the future is more privately owned restaurants, saying she loves to travel and try out the variety of restaurants wherever she goes. “I think that Bossier has the atmosphere and community to rally behind some new businesses,” she encouraged. If she could tell people one thing about Bossier, it would be that Bossier is filled with people who care about each other. She notes it is a safe environment with a community that supports each other, providing opportunities to help their fellow citizens be successful.